Manindra & Mahindra, the second largest utility vehicle maker by sales, after it conceded the pole position to rival market leader Maruti Suzuki, is all set to enter the international car market even as it has carved a name for itself as a premium car brand. While the much awaited all-new Mahindra XUV300 (pronounced XUV, 3 double ‘Oh’) will foray into the international market after it is introduced in India in February 2019, the Mahindra Alturas G4, a luxury SUV which redefined the high-end SUV segment in the country, made Mahindra a premium car maker. The Mahindra Alturas G4 was launched in November 2018 in Jaipur which made the brand as the most premium car maker among the Indian automakers. In fact, the XUV300 is Mahindra’s latest offering in the next generation of aspirational Mahindra vehicles, after the Marazzo multi-purpose vehicle or MPV and the Alturas G4. The Mahindra XUV300 is an extremely important product for the Mumbai-headquartered automobile major not only for the fiercely competitive Indian market but for its global ambitions as well. In fact, the Mahindra XUV300 is a premium offering in the sub 4-metre SUV segment. The company has identified overseas markets such as Europe, Latin America and South Africa among others where the Mahindra XUV300 could be sold. 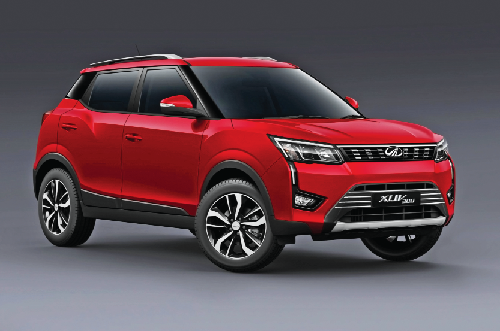 In fact, Rajan Wadhera, president, automotive sector at Mahindra & Mahindra, on the sidelines of christening the S201 vehicle as XUV300 in Mumbai, said the South African launch is scheduled close to the Indian launch in February this year. “The XUV300 is our latest offering in the next generation of aspirational Mahindra vehicles, after the Marazzo and the Alturas G4,” Pawan Goenka, managing director at Mahindra and Mahindra, said. He said the brand’s new breed of vehicles are products of engineering excellence, offering high refinement and are built on global platform. “The XUV500 enjoys huge equity in consumers’ minds and now with the XUV300, the XUV brand will evolve into a family of vehicles that stands for sophistication with performance,” Goenka boasted. Wadhera said the XUV300, built on a global platform, comes with many segment firsts. “The XUV300’s head-turning, cheetah-inspired design, ‘fun-to-drive’ performance, first-in-class hi-tech features, best-in-class safety and class-defining interiors, make it an exciting and comprehensive package that will find a strong connect and appeal among consumers,” he pointed out. The XUV300 will be sold in both petrol and diesel engines. The Mahindra XUV300 shares its underpinnings with the SsangYong Tivoli, albeit is a comprehensively re-engineered model over its South Korean sibling. In markets like South Africa, where the Tivoli is not sold, the XUV300 has a better chance to establish itself as a premium subcompact SUV taking on the likes of the Ford EcoSport, Nissan Juke, Renault Captur and the likes. The XUV300 could also be exported to the neighbouring SAARC nations where Mahindra already has presence. Based on the X100 platform, the Mahindra XUV300 is one of the more refreshing designs to come from the automaker and looks distinctively urban in its appeal.Also, elements from the Mahindra family design and the XUV500 too are visible on the baby SUV. The powertrain is new as well on the XUV300 that uses a 1.5-litre diesel engine from the Mahindra Marazzo, while there will be a newly developed 1.2-litre turbocharged petrol on offer as well. The transmission options will include a manual and possibly an automatic too, at the time of launch. Undoubtedly, the Mahindra XUV300 will be loaded with features to make a splash in the market in India as well as abroad. It will be equipped with six airbags, LED daytime running lights, push start/stop button, sunroof touchscreen infotainment system with Apple CarPlay and Android Auto, dual-zone climate control and more. All four wheels will come with disc brakes with 17-inch alloy wheels on top trims, while the SUV will also get ABS, ESP and EBD on offer. It is estimated to carry a price tag of Rs 8 lakh upward at pan India showroom. With the launch of Alturas G4, Mahindra entered into the most premium car space in the country. “We are changing gears and entering into growing premium car space in the country with the launch of the Alturas G4,” Goenka had told Financial Chronicle at the launch. He said the launch of the Alturas G4 was a significant moment in the automotive journey of Mahindra which will take the brand to the next level. With the Alturas G4, the company has decided to adopt an endorsed brand strategy which will heighten brand desirability and aspiration, Goenka pointed out. With the attractive starting price brand of Rs 26.95 lakh and going upto Rs 29.95 lakh pan India showroom for the top-end model, Alturas G4 rivals popular and segment leader Toyota Forturner SUV and Ford Endeavour SUV in Asia’s third largest economy. It could even take on the more luxury-oriented likes of the Skoda Kodiaq and the Volkswagen Tiguan. Mahindra, which earlier ruled the SUV space for years and yielded leadership to rival Maruti Suzuki two years back, is targeting about 10 per cent market share in the fiercely competitive premium space. The maker of popular models of Mahindra XUV500 and Mahindra Scorpio is aiming at selling around 450-500 cars every month of the new model. The new Alturas G4 is manufactured at the company’s facility at Chakan in Maharashtra and is essentially the new Rexton G4 with the rebadged Mahindra brand. It was showcased at the 2018 Auto Expo in New Delhi. “Our new SUV is the epitome of luxury in every sense. Therefore, we believe the Alturas G4 aptly redefines royalty which is also its positioning,” Goenka said. When asked about the sales target for the new model, Goenka said the company is eyeing 10-15 per cent market share of the premium SUV segment which is pegged at around 4,000 - 4,500 units per month in India. The new Alturas G4 is powered by a 2.2 litre 4-cylinder diesel engine which produces 133.1 kW (178 BHP) power and 420 Nm of torque. It comes with the Mercedes-Benz 7- speed automatic transmission in both variants - 2WD and 4WD. When it comes to safety, the Alturas G4 gets 9 airbags, electronic stability program (ESP), hill start assist (HSA), active rollover protection (ARP), traction control system (TCS), hill descent control (HDC). High-strength steel quad frame structure also offers an added layer of protection. The Alturas G4 is sold through separate high-end showrooms within the existing Mahindra dealerships in the country. These outlets are equipped with ultra-modern digital technology to provide an enhanced and immersive high-end experience for customers.